Every so often, Charlie says, "Let's have rice and black beans." So we do. OF COURSE I can't leave it at that. So this happened. 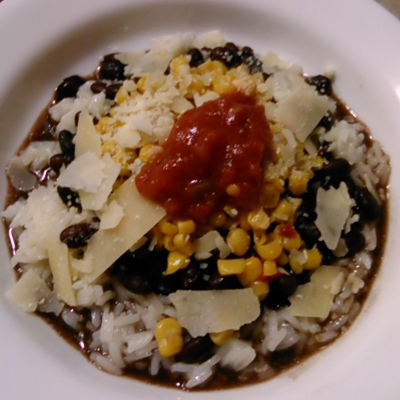 Rice, black beans (seasoned with cumin), fiesta corn (corn with red and green peppers in), shredded cheese, salsa. We et it with corn chips, o' course. And muy tasty it was, too. A Little TOO Healthy, But Still Yum!